Awards: Week 15 AUDL Player of the Week (2016), All-AUDL First Team (2016), Top 5 MVP Finalist (2016), Top 5 AUDL MVP Finalist (2017). Past Teams: Seattle Sockeye, Seattle Mixtape, Seattle Bigfoot, Outlaw, Seattle Voodoo, Seattle Rainmakers. "Really excited to climb the mountains with the Cascades and the organization. I love that their mission embodies integrity, community, and athletic excellence. They are strong advocates for gender equality and giving back to the community of Seattle. Seattle has such a special and unique ultimate community that makes Seattle easily one of the best places for ultimate. 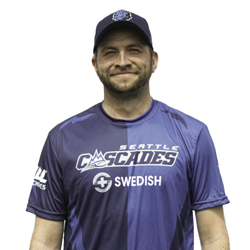 I believe that playing with the Cascades and being a part of their organization gives players opportunities to be ADVOCATES and not just athletes who play ultimate, but who help mold and reshape the way we look at professional sports and the game of ultimate. Pumped to be an ADVOCATE and BALLIN it up with the Cascades."